A year ago, the property boom was showing signs of fading and we expected property prices to fall in Sydney and Melbourne by around 5-10%. 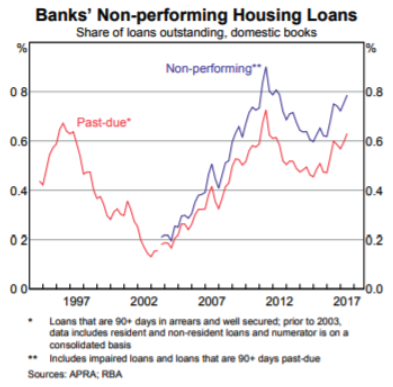 Home prices were overvalued, affordability was very poor and tightening bank lending standards in response to pressure from the bank regulator APRA was expected to turn the property cycle down. At the same time, we thought a crash was unlikely. Since then average prices are down about 5% in Melbourne and 8% in Sydney. Nationally, prices are off about 5%. Going forward, we expect more weakness based on a range of factors. You can see these factors in a wire I wrote last month here. In short, we now expect prices to fall around 20% top to bottom in Sydney and Melbourne and by 10% for the national capital city average. With prices now falling naturally, the calls for a property crash are getting louder. Our assessment remains that a crash – where national average prices fall by 20% or more over a year are unlikely unless we see much higher interest rates or unemployment (neither of which are expected) or a continuation of recent high construction for several years (which is unlikely as approvals are falling) and a collapse in immigration. However, the risk of a crash cannot be ignored given the danger banks may overreact to the Royal Commission and become too tight making investors decide to exit in the face of falling returns. Below are 5 charts that provide context on my views and highlight some of the key drivers I’ve identified for house prices. 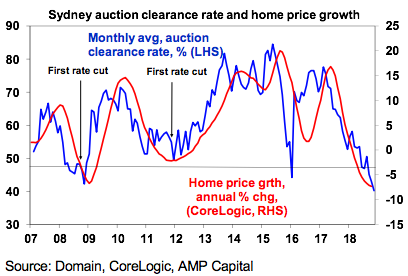 My favourite charts are the auction clearance rates because they are timely and have a good cyclical relationship with property prices in Sydney and Melbourne. Both are pointing towards more downside in property prices. Chart 3: Housing-related credit slowing to record lows? Growth in housing-related credit is critical to keep an eye on given the tightening in lending conditions. 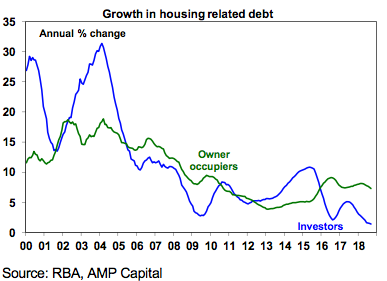 It has already slowed to record lows for investors and is looking weaker for owner occupiers too. 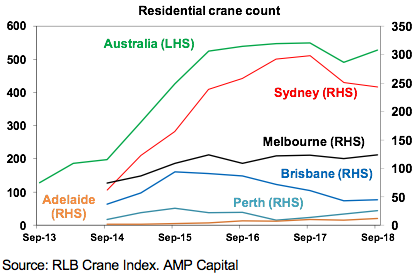 The residential crane count is worth watching as a guide to how much unit supply is yet to hit the market. It’s down from last year’s record high in Sydney but it remains very high as it does in Melbourne. Chart 5: Increasing risks of forced sales? Finally, the bank’s non-performing housing loans are worth watching. If they increase more significantly it would point to an increasing risk of forced sales which would accentuate the weakness in house prices. Great article, thank you! There seems to be a small problem with the first chart. 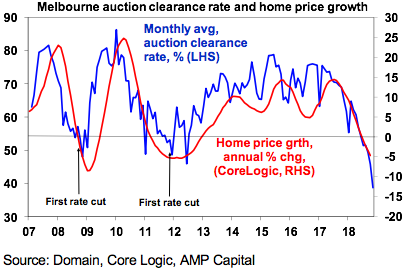 Should not the horizontal line be at zero on 'home price growth' (RHS of the y axis) like it is on the Melbourne chart following? At the moment it looks like it's at about -3.5% for some reason, or am I reading it wrong? Comparing the Sydney and Melbourne charts is slightly deceptive as it looks now.